Our favorite resources for raising daughters and sons to be passionate followers of Jesus Christ. Lessons in Responsibility for Girls, Level 1 (also known as Home Economics for Home Schoolers). By: Anne White. Simple projects with instructions that teach basic skills of keeping a home. A Girl of Beauty: Building Character in Young Girls. By: Carol Fiddler and Elisabeth Elliot. An unusual scripture-based study of character including how to handle disappointments and being a sunshine maker. 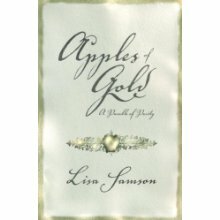 Apples of Gold: A Parable of Purity. By: Lisa Samson. My daughters voted this their favorite book on all the lists! So tastefully written so that young girls think that guarding their "purity" is saving their first kiss and older girls who have had "the talk" recognize it means much more. Becoming a Daughter of Destiny: Letters to a Daughter About Discovering Her Purpose. By: Joy Moore. A scripture-based guide to help your daughter identify her spiritual gifts and begin to discover the divine plan God has for her life. 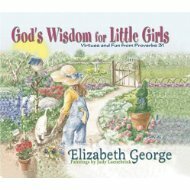 Growing Little Women: Capturing Teaching Moments with Your Daughters (ages 7-10). By: Donna J. Miller and Christine Yount. Stories and scriptures to read together and questions for each of you to answer. A great way to connect with your daughter. 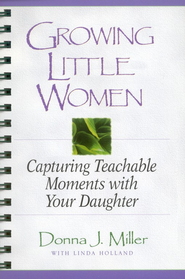 Growing Little Women: Capturing Teachable Moments with Your Daughter (ages 9-12). By: Donna Miller. Stories and scriptures to read together, questions for each of you to answer. A great tool to improve or build your relationship. Lessons in Responsibility for Girls, Level 2 (also known as Home Economics for Homeschoolers). By: Anne White. Simple projects with clear instructions to help girls learn skills for keeping a home. Hind's Feet on High Places. By: Hannah Hurnard and JoAnn Edington. An allegory similar to the style of Pilgrim's Progress that speaks to hearts on multiple levels. Just Mom and Me Having Tea: A Devotional Bible Study for Mothers and Daughters. By: Mary Murray. Making Brothers and Sisters Best Friends: How to Fight the Good Fight at Home. By: Grace, Stephen and Sarah Mally. Humorous and practical suggestions to bring peace between siblings. 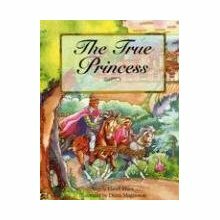 Life Lessons from The Princess and the Kiss: Planting Seeds of Purity in Young Hearts. By: Jennie Bishop and Susan Henson. Includes a ceremony guide. Being a Girl Who Leads: Becoming a Leader by Following Christ. By: Shannon Kubiak Primicerio. Before You Meet Prince Charming: A Guide to Radiant Purity. By: Sarah Mally. 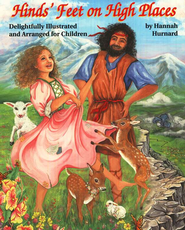 A fairytale is woven throughout to introduce and apply principles of courtship to girls in our world today. The Gift of Purity: Letters to a Daughter About Guarding Her Heart. By: Joy Moore. She has questions. You need answers. It is a parent’s responsibility to provide accurate facts in the context of godly principles. Picking up where Lady Day left off, this book of letters addresses physical and emotional purity, conception in the context of marriage, and courtship as an alternative to dating. The Gift of Purity provides helpful information as parents communicate openly with their daughter about living a pure life. Girl Talk: Mother/Daughter Conversations on Biblical Womanhood. By: Carolyn Mahaney and Nicole Mahaney Whitacre. 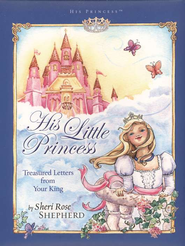 His Princess: Love Letters from Your King. By: Sheri Rose Shepherd. A devotional with powerful words of encouragement and identity. Every Teen Girl's Little Pink Book for Daughters. By: Cathy Bartell. Every Teen Girl's Little Pink Book on Girlfriends. By: Cathy Bartell. How to be a good friend, how to choose friends wisely. Every Teen Girl's Little Pink Book on Gab. By: Cathy Bartell. Words of wisdom about taming the tongue. Every Teen Girl's Little Pink Book on What to Wear. By: Cathy Bartell. Based on the amor of God. A Young Woman After God's Own Heart: A Teen's Guide to Friends, Faith, Family, and the Future. By: Elizabeth George. A Young Woman's Walk with God: Growing More Like Jesus. By: Elizabeth George. A Young Woman After God's Own Heart: A Devotional. By: Elizabeth George. The Divine Dance: If the World Is Your Stage, Who Are You Performing For? By: Shannon Kubiak Primicerio. Especially meaningful to daughters who are dancers, reminding them to only perform for an audience of one--their Creator.